LORD OF PAGATHORN: "DAIMONO PHILIA" NEW ALBUM & LYRIC VIDEO Lord Of Pagathorn will release their second full-length opus "Daimono Philia" in January 2018. Album consist of intro and eight new songs. The lyrics are dealing about the evil itself, revenge and the crush of the holy trinity. Album will be released by Woodcut Records. 3. "Nekros Philia" Digipak CD + T-Shirt 28,90eur. 4. "Nekros Philia" LP + T-Shirt 32,80eur. Digipak CD + T-Shirt price incl. Shipping cost! We have been recording the invocations for the first full length theme album, titled as ”Nekros Philia” during the year 2013 in Drophammer Studios. The recordings are now completed and the next process will be the mixing of the album. We have also united our forces with Helgorth / Babalon Graphics for the album cover artwork. The album will be released under the waning crescent Moon in the year of the Devil 2014 by Woodcut Records. Official "MSILIHPORCEN" 12"MLP released by Satanic Records. You can find copies from these labels and distributions: Woodcut Records (www.woodcutrecords.com), Iron Bonehead (http://www.ironbonehead.de), KVLT (http://www.kvlt.fi), Record Shop X / Levykauppa Äx (http://www.recordshopx.com). 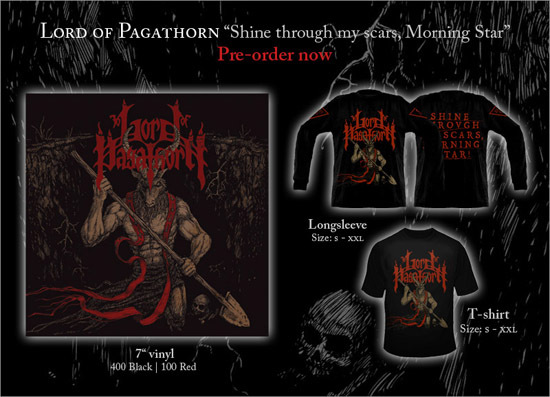 Lord Of Pagathorn "MSILIHPORCEN" pro cassette version available from Satanic Records (Mexico). 12" vinyl version coming later this year!